When it comes to London corporate events, we deliver the highest standards. Whether you are celebrating in your own home, marquee or outside venue in London. 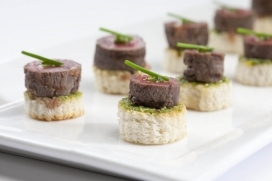 We are flexible enough to provide just the catering, or organise and manage the whole event. "Our food will fill your heart with joy and happiness"
If your mouth is watering then why not try some of our delicious food. Join one of the drivers as he visits the market at 5am in the morning to choose the best ingredients for your lunch, and see what we do with it. We do this every morning to make sure your dishes are always fresh and of a very high quality. Get to know the team! Take a look at the different faces and personalities across the company, and see what we have been up to and what drives us to make AH one of the best business catering operations in London. Provides independent endorsement that caterers are taking steps to improve their food standards on nutrition, freshness, sustainability, and animal welfare.